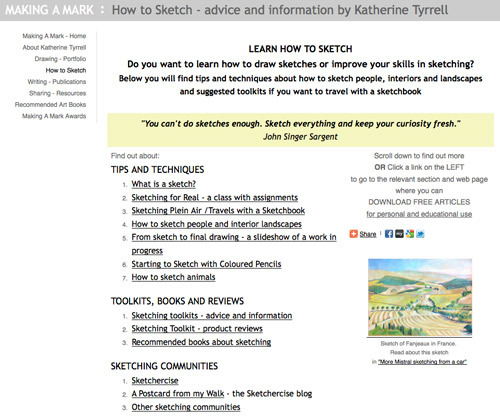 "Travels with a Sketchbook" recommended by "The Times"
Just in case you missed the news - I'm absolutely delighted to announce that this blog Travels with a Sketchbook AND my advice on how to sketch were both highlighted and recommended by "The Times" newspaper last week! That's the London newspaper with the name which was borrowed by every other newspaper with 'Times' in its title all around the world! You can read the piece - included in the "Daily Universal Register" page below. It's very pleasurable to read people's perspectives on your work when they are as good as this! It was nice to see that Urban Sketchers got the the "If you liked this then you might like this too" slot. Tomorrow - I'll be highlighting my article about Ten reasons to sketch with coloured pencils which will be published by Derwent's LovePencils blog on Tuesday 1st March 2011. This was the sketch I couldn't post. It had been physically posted to California and was due to make its first appearance on the new blog I'm participating in with my Sketchercise pals - A Postcard from my Walk. A Postcard from my Walk records a monthly postal exchange of sketches on postcards between 14 members of the Sketchercise group over the course of 14 months - until every person has sent a postcard to every other person. The aim is that we produce a postcard while taking exercise - and then, rather than posting it online on out blogs, we post it in the letterbox! The idea was the brainchild of my friend Ronell van Wyk who lives just outside Tours and right next to the River Loire in France. She had us all organised and raring to go in no time at all! Many postcards are travelling many miles before they reach their destination as we live all over the world - as you can see below! Over the coming months we'll all be posting about how we are all addressing the issue of creating a sketch on a postcard, what that means for us in terms of adjusting to a different scale and how we're managing to wangle our favourite media into a postcard sized support. Albrecht is an old hand at mail art projects and will doubtless be able to provide expert advice. I'm about to embark on experiments with mountboard! Plus I'm thinking about trying out Daniel Smith's watercolour ground and seeing how that works with the media I use. I'll be posting about how I get on in future posts. The landmark Darwin Centre is now open to the public. Museum visitors can explore world-class science in action in a dramatic new public space. 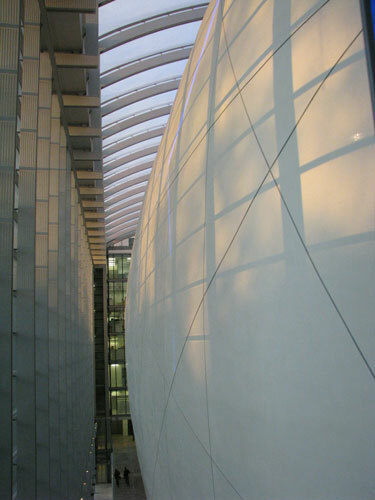 The Darwin Centre is a state-of-the-art science and collections facility. The building is the most significant expansion at the Museum since it moved to South Kensington in 1881. Irrespective of what it contains, the new Cocoon - where I sketched my butterflies from specimens on display - is worth visiting just for its stunning architecture. See architectural highlights here. I spent a long time with my head tilted upward staring at its shape and wondering how they built it - and what on earth it was like inside. This page on the website explains what's inside the Cocoon. In reality visitors only see a part of the inside - as the pathway winds down a slope past various exhibitions. It was fascinating to have windows which let you watch real people doing real things to real specimens! I have to tell you Macs seem to rule at the Natural history Museum! There's lots of emphasis on technology and the Interactive Experience and being part of the whole process. I have to confess my first attempt at packing for an expedition in a rain forest was pretty useless but I tried again and got much better at it. 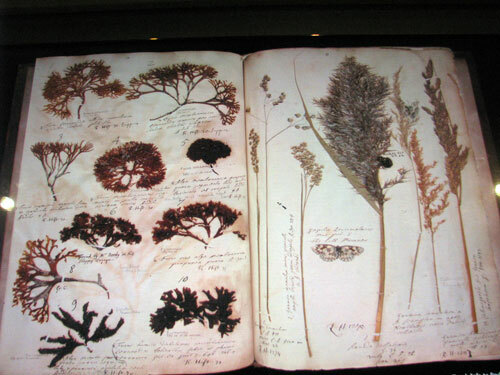 It also taught me a lot about what the naturalists use to preserve specimens these days - which was fascinating given my interest in botanical art. My one piece of advice is be very careful as you approach the window on your left as you get out of the lift. Even if you don't suffer from vertigo. the extent of the sheer drop on the other side of the window will make you go weak at the knees! Today this blog is featured in the Daily Universal Register page of The Times newspaper! 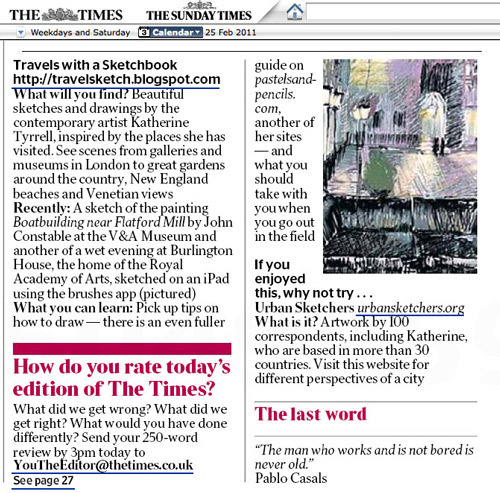 See what the Times has to say about me and my sketches! I'll do a proper post about this later. 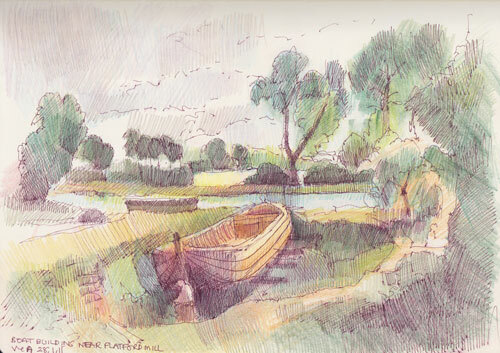 My sketch of Constable's "Boatbuilding near Flatford Mill"
This is my recent sketch of John Constable's painting Boatbuilding near Flatford Mill (which I thought I'd already posted and then discovered I hadn't!). In reality this painting is 50.8 x 61.6 cm (20 inches x 24.25) which means I've got the format wrong. However I chopped off a chunk of sky and some of the foreground! It's worth checking out the dimensions on a painting before starting to sketch it in a museum as it helps to get the picture format within your sketchbook correct. You don't have ot draw the whole painting and it's fine to draw only the part that you like! The actual size of Constable's sketchbook is astonishing given the size of the paintings it generated. It's just 11.3cm x 8.6cm (that's 4.5 inches x 3.38 inches ) - really tiny! The one on display was used during 1814. 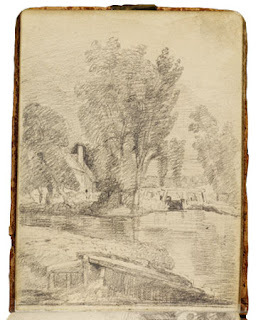 Constable filled his pocket sketchbooks with figures and scenery, many of which reappear in his paintings. 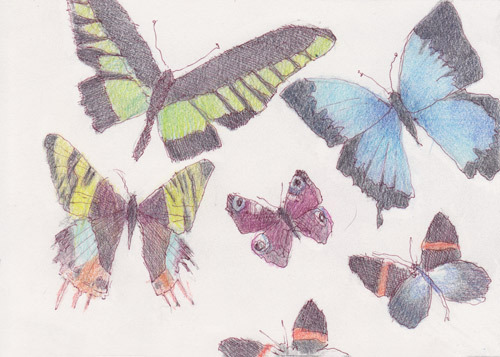 A selection of images from the sketchbook are shown on this page. remember how big they really are! they're not value designs but they do give a sense of values as well as recording what he saw. This is a link to some of Constable's oil sketches - also in the museum. Yesterday I was at the Mall Galleries for the press preview of the Pure Gold exhibition which celebrates the 50th birthday of the Federation of British Artists. The exhibition had been hung and there were people finishing off labels and all those final details which take time but need to be got right. 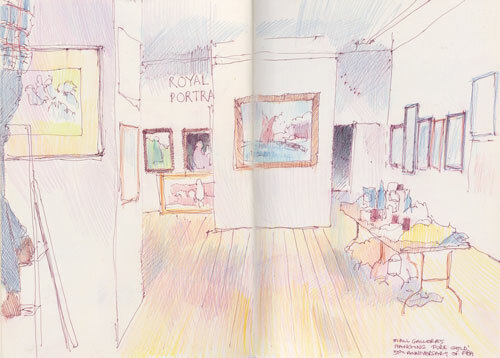 I love watching people working on an exhibition so when I'd finished having a good look round I did this sketch. Mostly people were engaged in non-stop activity so I thought I was only going to be able to sketch the gallery - until I realised I'd got the chance for a bit of "man up stepladder" activity off on the far left. I've also got some photographs of those doing the meticulous hang of the sign for the Society of Wildlife Artists. It could make a great drawing! pen and sepia ink in Moleskine Sketchbook, 8" x 10"
On Friday, the Drawing London Group which I belong to visited the Natural History Museum for our monthly outing. I was on a mission to produce a sketch for one of the Sketchercise members participating in "A Postcard from my Walk". Like I said in my last post, museums and art galleries provide lots of opportunities for walking out of the nasty winter weather . They are particularly valuable for me with my dodgy feet which don't like the cold, wet or icy underfoot! So I figured the outing would give me lots of opportunities to find a subject for my postcard. I was rather worried as I was going to be sketching at a completely new size for me 7" x 5" (having abandoned the idea of even trying 6" x 4". The problem is I'm used to sketching big and this new size proved to be a bit of a problem. 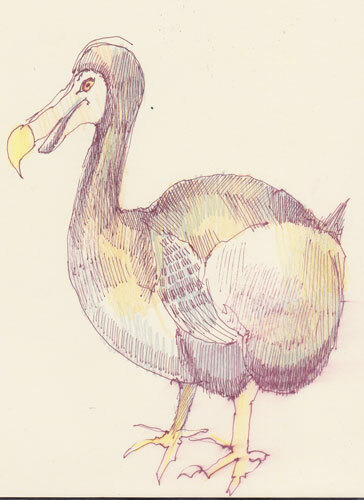 I decided to have a go at sketching the Dodo. I reckoned that had to be a bit unique as subject matter goes! There are several types of images in the Natural History Museum (of which more in another post on Making A Mark). 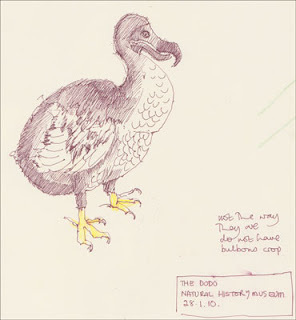 I started by trying to sketch the engavings and paintings of a dodo in the Images Gallery. Well - I don't whether it's because it's a very odd looking bird or I just don't like sketching small but the first sketches came out looking rather odd. 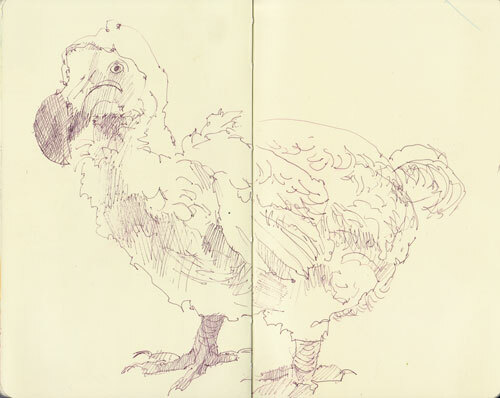 Having managed to get the second dodo sketch to actually fit a 7" x 5" space, I decided that maybe this wasn't the ideal subject as I felt I was cramming him in. Obviously my eye was not used to having to sketch so small. 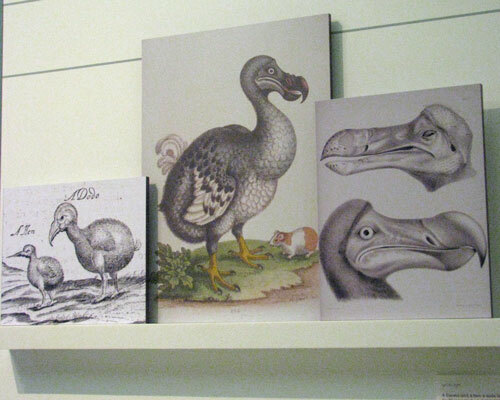 Also what I really didn't like either of the sketches as the dodo in both looked.....stuffed - if not wooden! I finally came across "the real stuffed dodo" in the birds gallery and was able to produce the sketch at the top after I abandoned the constraint of the 7" x 5" format and went back to 8" x 10" which is the format I've used for a long while. I'm much happier with that one! Those tiny marks at the bottom are people walking up stairs! At the end of the day I found completely different subject matter to sketch for my Postcard from my Walk (to Orange County California). The subject in question was right at the entry to the Cocoon and next to this floor to ceiling window - which left me feeling very wobbly and rather queasy! It's ages since I've felt myself impelled to fall off a vertical drop! Thank goodness there was a window inbetween!